Of course it is not that simple and yet there is simplicity in the beginning. But once the oxytocin has worn off. Once the soft warm silent sleeping/eating/pooping bundle in your arms begins to cry and wail and scream. Once you have searched the internet for answers to every inane question only to find a wealth of contradictions. Once your partner, if you are blessed enough to have one, has returned to work. Once you are utterly alone with this being you have created. You may find yourself in a pit. Not every mother falls in, but for those of us that do, it is a dark and silent downward spiral into the sludge and many a nail is lost clawing our way back to the light. It is not simply a question of identity, which has transformed from whatever it was into Mother, but the mind spins wicked tales of doubt that force the question of sanity. What have I done? I should have never been a mother. I am not meant for this. I am a horrible mother. I don’t love my baby enough. I don’t know what I am doing. I am failing. I am a failure. I am damaging this little being. What have I done? And the guilt for all these questions weighs heavy. And if you think of suicide or escape or cry constantly then perhaps you take on the label “postpartum.” But if the thoughts are more subtle and the descent more insidiously slow then you may feel beyond the label and go without, without treatment, without help, without understanding, without forgiveness. You may pretend you are fine, functioning, because you are still able to sauté the garlic a perfect golden brown and vacuum the dog hair off of the Chinese rug and put on mascara and cut the baby’s tiny fingernails without drawing blood. And yet, you are totally detached. You move through the days and nights, which are merely distinguished by the light in the room, like the shadow of a person. And because of the glamorization of motherhood in our culture, the glossy photos in the magazines you once read while waiting for your ultrasound where perfect mommies delighted in baby toes, because it is supposed to be beautiful and blissful and divine and a blessing devoid of hardship, you keep quiet. You stare at the alien baby flailing on the mat. You stare at your hollow reflection in the mirror – sallow skin and wrinkled eyes. You stare into the endless void that has become your life. You are stuck. That is not to say there aren’t moments of joy, that the first laugh does not tickle you, or that the genuine smile when you come to the crib first thing in the morning does not delight you, but the mind is in a state of disarray, thoughts cracked like shards of glass that whirl about in a chaotic dance and leave you cut and broken. Ask for help. Reach out. Nurture yourself. So the advice goes. But it seems impossible. Who could help you? Who would want to when you are so terribly selfish and ungrateful and damaged? Who could you share these horrible thoughts with? Even a professional would judge you. But as bad a mother as you feel, you are not ready to hand over this being to some stranger so that you might have time to yourself. You cannot fathom how to nurture yourself when the self you knew has long disappeared… What could possibly make you happy? So you smile and nod at the advice-givers who look at you with that twinge of worry in their eyes. And you continue to do nothing. No one told you it would be like this. No one told you this is normal, or at least a shade of grey between the white of bliss and black of clinical depression. There is deep-seated shame around these feelings. It is taboo, almost sacrilegious, to speak any ill of the role of Mother. You should love your baby with all of your heart. You should feel like your heart has left your body to reincarnate as this being. You should be grateful, especially if you tried for months or years. You should. You should. You should. There is no room for pain or regret or loss. But the feelings cannot be submerged so you are the one drowning. It would be flippant of me to tell you to ask for help, reach out, nurture yourself, and yet this advice stands true. Talk to your OB or your GP or your therapist. Confide in your partner, your sister, your mother, your aunt, or your friend. If you are not ready for that step then take one that feels surmountable. Shift your gaze just slightly enough that you might see a shaft of light in the darkness. Notice that you are not your thoughts. Look into the eyes of this little being who has no hatred for you or judgment of you. Let go of the shoulds. Feel what you feel without exaggerating the feeling, without making it any more than it is. Open up to other mothers because when you do they may surprise you with similar stories when all you witnessed was their perfection – in not wanting to contaminate each other’s experience we only further alienate ourselves. Hold the space for each other to be flawed. Write, even if you are not a writer. Even if the idea of a pen and a journal or a blank screen and a cursor terrify you. Write as an exorcism. Write to purge, to externalize the feelings. In writing this I made my way that much further out of the pit to truly love this little being in all her glory. Now when she screams I bare witness and open to her rather than bare the burden of fault and overwhelm. Now when she smiles she lights up my entire being. Remember that from the sludge the lotus is born. 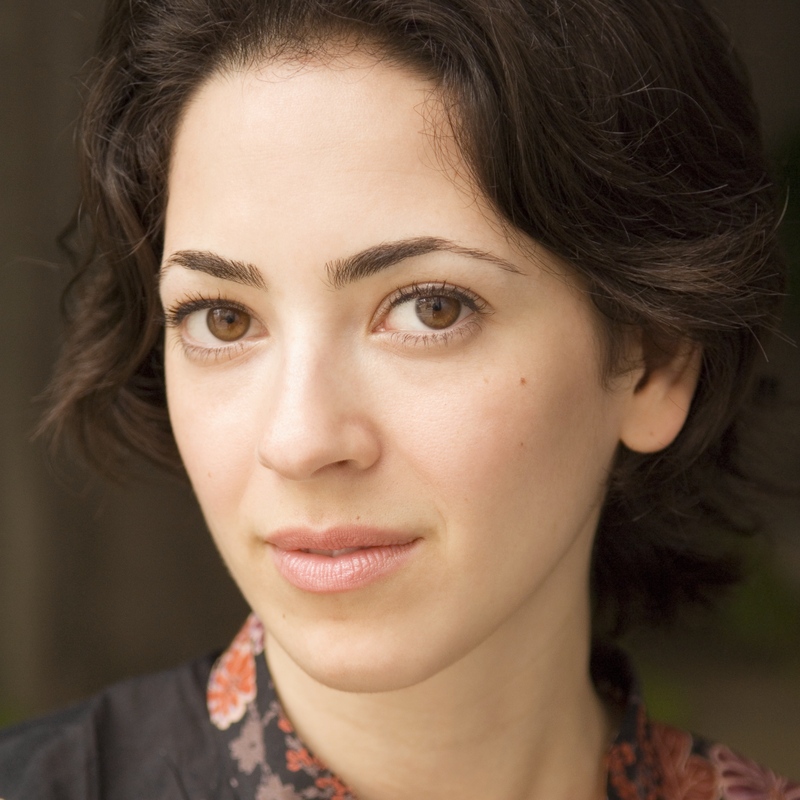 Eve Kagan is a critically acclaimed actress, international theatre teaching artist, and yoga instructor. She is a Harvard graduate with an EdM specializing in Arts in Education. Eve has a passion for empowerment and empathy. Whether it is on the stage, in the classroom, or on the mat, she finds ways to encourage those around her to delve deeper into the human experience with an open heart. She travels the world with her husband, one year old daughter, and seven year old English Setter. To see holistic parenting products recommended by Eve, CHECK OUT HER MAMAJAMAS LIST.